I’ve been thinking about the conductors who made a difference to my life – not on record, but in live performance, the ones who taught me to live in the moment, and transcend it. These are the maestros who came to mind. The omissions? Karajan, Böhm, Ormandy, Maazel, Mehta produced off-the-shelf performances. Gergiev in the early 1990s delivered some of the most exciting concerts imaginable, only to compromise his work with skipped rehearsals and dark political connections. The list remains open. I hope to add more with the passage of time. Kirill P and Mirga G could be contenders. What is it about this that you don’t find transcendental? Shh. Don’t disrupt the break we are getting. Even Mirga may feel relieved about it. There is a saying that God gets bored with too much Kyrie Eleison. Meanwhile, I’ll just offer Kurt Masur. +100 And this is what brings out the worst in comment-makers on Youtube. I’m just going to stand on the sidelines and see if anyone mentions Barbirolli, Boult, Beecham or, more recently, Handley. The frequency with which British musicians seem to flee the minds of those who have opinions on any aspect of music, especially English opiners such as NL, is always notable, though perhaps especially in prevailing conditions. Thank you for mentioning the three Bs of English conducting. I too was hoping someone would. I could not, not having heard any of them in person. I do have almost every recording Boult made and while not all are top drawer in comparison with other conductors, they do what I call “satisfy” and in many cases, especially English music, much more than that. We can thank Lyrita for recording so many of them. And EMI too. Just remembered that I did hear Beecham. It was in San Francisco. One of his concerts was cancelled due to illness. There was no replacement and someone from the symphony stood on the front steps of the War Memorial Opera House and announced that Mr. Meecham was ill and there would be no concert, so go home. I felt like telling him that the name was “Beecham”, not “Meecham”, but let it go. At the other concert he (Sir Thomas) sat in a chair and cracked jokes to the delight of us all. Forgot what his program was. As it should because everyone grew in a different environment. Some, perhaps a majority of music lovers worldwide, grew up in provincial town with less than famous orchestras and conductors that were not “stars”, whatever that may mean. But these conductors and orchestra did instilled in that person the love for music. If that is the case, these conductors and orchestras mattered. Here we go again. Dead conductors heard live: Karajan, Böhm, Kleiber, Bernstein, Sanderling, Jochum, Maazel, Boulez, Kubelik, Celibidache. Living conductors heard live: Haitink, Barenboim, Gatti, Thielemann, Salonen, Gergiev, Muti, Mehta, Mirga, Blomstedt. Yes, Pierre Monteux. Heard him in San Francisco many times in the 1940s and 1950s (season ticket holder). Ever heard of a certain Claudio Abbado? yes. saw him many times. Norman: you didn’t put him in either the positive or negative list. Is that how you feel about him? (How you feel is up to you, and I don’t wish to suggest your taste is right or wrong; personally I find your thoughts very interesting and I am curious to hear more). It’s all personal opinion, but I’ll put up Toscanini and Furtwangler. Missing from this list – Koussevitsky, my favorite growing up. Also heard live: Toscanini, HvK, Ormandy, Van Beinum, Janssons and played for Monteux, Mitropoulos, Bernstein, Serafin, Kondrashin, etc. Again, my apologies. Re: my later comment. So I’ll mention Ormandy, Haitink, and Skrowaczewski. Blomstedt, Haitink, Rozhdestvensky, Dohnanyi, Kempe, all heard live and 3 still alive. Conductor that made a personal difference? For me, Mehta with the LA Phil. Nice performances of Mahler, Bruckner, Strauss, etc. But there are quite a number of recordings by Karajan which belong to the best available. I’m not drawing-up a list, but that should be clear for anybody who has listened to many of them – even if it is not always to everybody’s tase. Karajan comes immediately after Kleiber as the most fascinating in the last 25 years – just listen to the younger Karajan, simply amazing! Add Bernstein and Tennstedt plus for Italian repertoire Abbado, Muti and also Giulini. Don’t forget Abbado conducting Mahler in Lucerne, peerless! 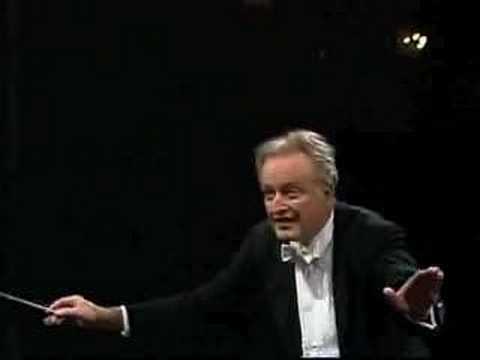 Only Kleiber surpasses even them in Italian but the little he conducted which is available: peerless all of them, Boheme, Traviata, Otello and Falstaff. Totally overrated was the cold Solti, Celibidache fascinating and best with Bruckner like Guenter Wand. AND people who heard Toscannini and Furtwaengler live can’t forget them either. Aren’t hose two the greatest ever?Voila, Carlos Kleiber for me definitely the most exciting I ever heard and nowadays only Petrenko might be in that league but definitely not the other most overrated Simon Rattle. He finally left Berlin! AND forget all the rest from Mehta to Maazel, Levine etc though they did some very good perfomances also. AND before the unbearable hype around Currentzis (exiting though!) there were the fanstastic apostolic Norrington, Gardiner, Hogwood and Pinnock for the early classic. Mozart thanks to them sounds exciting and real; also fantastic in it was Charles Mackerras. Good list. I’d add Haitink and Boulez. Not sure who I’d drop, though…. I can only think of Frank Shipway and Vladimir Jurowski right now. Two of my favourite conductors – and human beings. I feel so lucky I had the chance to know them both personally! Sir Charles Mackerras – surely left off as an oversight? Yes. The best concert I’ve ever seen live was CM conducting Philharmonia in Beethoven 9th at Colston Hall (as a later sub – some, including me, would say ‘massive upgrade’ for Dohnanyi). In that one evening I learned so much about pacing and tension, which lessons have stood me in good stead ever since (and apply to opera conducting as well as concerts). Lovely man, too, who was kind enough to reply to a letter I wrote to him asking various questions. I’d love to have seen Kleiber and Tennstedt. If T was half as good live as his 1989 Mahler 2 concert recording suggests he must have been awesome. One of my biggest classical music regrets is that I started attending Philadelphia Orchestra concerts early enough to have seen Tennstedt a handful of times before he stopped coming. But I didn’t really know who the best guest conductors were yet and also hadn’t developed an ear for Mahler and Bruckner, as I would not many years later. Agreed. I saw Mackerras conduct an eclectic program of Wagner, Dvorak, Delius, and Elgar with the Berlin Phil. I don’t think many other conductors could have pulled that off. Great fun. …and find him wanting. I don’t expect his reputation ever to be what it was from the 1970s through the early 2000s. The large but undistinguished commercial discography will be the opposite of helpful to him. Yes, I agree. He will be rated as Mehta and Maazel are. Competent. But not great. Never seen, or ever likely to see, the conductors who have mattered most to me, in live performance. Unless you count playing for them, in which case there are several, but nobody famous. Love him or hate him, Sergiu Celibidache was a conductor who really mattered. I would also consider Carlo Maria Giulini and Claudio Abbado among those whom I have heard live, in concert, who created performances that mattered. Wolfgang Sawallisch mattered especially in the core German repertoire, IMHO. I had the honor of having worked with the first five. No Claudio Abbado? No Sinopoli? Major omissions, no? Anyway, no one can improve today, and I mean no one, on the exceptional Kirill Petrenko, a man with an uncanny ear reminiscent of Sawallisch and Kleiber fils. If in doubt, ask Munich and Berlin and you shall hear. Arguably the quality of Sinopoli’s performances uneven. Yet at his best he could draw transcendental interpretations, especially in opera, e.g. Manon Lescaut. For those, he richly deserves to be remembered. Sinopoli had no counterpoint, and that Manon Lescaut is an over-hyped horror. Try Muti on the same label (DG) for proper phrasing and good structure. I’m glad there still are a few admirers of Giuseppe Sinopoli. His Live performances of Mahler’s 5th and 7th were mind-blowing, despite the resentment and near ridicule he got from the London press. He was a true visionary, a master of orchestral sonorities and a sound magician, something you can’t exactly find today among some mediatically over-hyped “Podium lions” today. So Karajan’s live performance of Mahler’s 9th is dismissed as an “off the shelf” performance. What nonsense! I fear your prejudice is showing. Um…these are Norman’s tastes. Can’t you accept he may feel differently to you about Karajan’s conducting? Kirill Kondrashin, Gennady Rozdestwenskij…? I vividly remember concerts in Amsterdam with each conductor, after decades. Although I haven’t seen either of them live, this post reminds me that I forgot to include Temirkanov in my earlier post. I’ve seen him twice in Philadelphia and both concerts would probably rank among my top 10-15. He really drew a great sound from the Philadelphia. Sawallisch made the biggest impact on me among conductors I’ve seen live because I saw so many more outstanding performances led by him than by any other conductor; this during his time in Philadelphia, when I lived around the corner from the Academy of Music. I’ve mentioned on here before that there was about a 4-5 year period surrounding the turn of the century when I became a huge fan of the man. Other conductors who made a huge impression with one or two phenomenal performances that still stand out in my memory as major events were Abbado (Mahler 9 and LvB 6 with BPO), Rattle (Gurrelieder with Philly), Barenboim (LvB7 with CSO and Schubert 5 with VPO) and Nezet-Seguin (Verdi Requiem in Philly). Mine are somewhat obscure since I don’t venture off the East Coast of the United States very much. Which all goes to prove what a senseless exercise this is. Plenty more possibilities, but enough already. all heard live and 6 still alive. Karajan isn’t on this list, but Marriner is? Now I’ve seen it all… And yes – what about Abbado? It surprises me that there is no mention (unless I missed it) of Sir Colin Davis. Has he been forgotten already? He is one of at least 23 “famous” conductors that I have heard in live performance. Also surprising to me is the absence (again, unless I missed it) of Erich Leinsdorf, William Steinberg, Charles Munch and Serge Koussevitzky whom I did not hear live. Rummaging my aural memory, it astonishes me that I still remember particular aspects all of the 23 conductors I have heard over these many years. So I guess they all mattered to me in their individual ways. I heard LEINSDORF live in 1989 & it was very special; just wish I had seen Munch! I met them both several times. I wouldn’t miss out Giulini, or indeed John Barbirolli. My next concert, the next season, found the orchestra’s Music Director on the podium: Serge Koussevitzky. 1940 marked the centennial of the birth of Tchaikovsky and Koussevitzky marked the occasion in three concerts which paired a Tchaikovsky Symphony with a Beethoven Symphony. My concert was Beethoven 4, Tchaikovsky 4. My life really began that day. I left Symphony Hall in a daze, and though I knew i was not going to be my generation’s Heifetz, I also knew that my life had to be in music. From that point on I buried myself in studying everything about music I could get my hands on, and I attended every concert of my newly-discovered wizard, Serge Koussevitzky. my vote for the greatest conductor in my experience: Serge Koussevitzky. I do so not only because of the many truly extraordinary performances of virtually the entire symphonic repertory that I heard him conduct. But also because of his herculean efforts on behalf of the living composer. This began in his young years in Russia when he formed a publishing house to print the music of emerging young composers, principally Stravinsky and Scriabin. Among his accomplishments during his four-year residence in Paris (1920-1924) he commissioned Ravel to compose an orchestration for Moussorgsky’s piano suite “Pictures at an Exhibition”. Among other Koussevitzky commissions in Paris was the Third Symphony of Roussel. While in Paris he had met the then 24-year old Aaron Copland, who was there studying with Nadia Boulanger. Instantly Koussevitzky commissioned Copland to compose a symphony, his first, which Koussevitzy premiered in Boston in his first season there. Some 20 years later he was to commission what turned out to be Copland’s Third Symphony. Symphony, Thompson’s Second Symphony, Bartok’s Concerto for Orchestra, Britten’s “Peter Grimes”, Martinu’s First Symphony, and on and on. summer music festivals and academies. Come to think of it, I’ll unhesitatingly name Serge Koussevitzky as the MOST INFLUENTIAL and IMPORTANT conductor of all time. Thank you for your most pertinent comment. finally, a mention of bruno walter, my first beethoven, brahms and mahler. The Kleiber in my list was Eric, in Wozzek. A very interesting list from Norman, which of course reflects his tastes. I am very curious about the omission of Abbado, and of Haitink. Both had extensive London careers and are usually well regarded by critics. I would love to understand what you don’t like about them. I suspect K.Petrenko will end up being a favourite too. And isn’t Pappano thought to be a terrific opera conductor who has been wonderful for the Royal Opera House? Yes to Klemperer! Saw and heard him at the Royal Festival Hall in the 1950s never forgotten even when he could hardly walk on. My favourite lp is his Mono version of Beethoven’s fifth with his Philharmonia Orchestra. Still playing it these days, inspiring stuff. The conductor who made most difference in my life was Jascha Horenstein. I attended many of his London concerts, most memorable were Mahler (1, 3, 4, 5, 7 & 9), Bruckner (3, 4, 5, 6, 8, 9), R. Strauss (Alpine, D&T) but there were many more. I also heard Szell do Mahler 6 and Knaben Wunderhorn in London and a Mozart Jupiter symph. that blew me away. Equally memorable were Klemperer, twice doing Beethoven, and Stokowski, once in Tchaikovsky 6. Wow. You never heard Beecham, Stokowski, let alone Fruhbeck de Burgos, Celibidache or the great Russian conductors? If not, you should not be making such spurious lists. It damages classical music, which is an art, to treat it like sports with such ideas as their being “top” anyones, or top tens. Stop. A little boy was taking a stroll with his father and passing a graveyard he spotted a gravestone on which was engraved ‘ Here lies an orchestral conductor,a great musician and a humble man.”Daddy,how could three people fit into such a small grave?”. I would ask if you perhaps reconsider Maestro Karajan as Off-the Shelf? I myself have not seen him live, however several secondhand accounts close to me have attested that though Karajan certainly had his strengths and weaknesses, much of his oeuvre certainly was life-changing; notably his Wagner, Beethoven, Mahler, Bruckner, etc. Even his legato approach to Mozart and Bach was worth consideration and merit, in my humble opinion. Not to mention, his Operas during his time at the Wiener Staatsoper were reportedly grandiose. Perhaps could I get an opinion from you? I wish I had seen live Klemperer, Szell and Kubelik, but especially Klemperer. Abbado, Ashkenazy, Barbirolli, Davis, Haitink, Karajan (despite his Nazi connections), Mehta, Previn, Salonen, and Solti would be my ten irreplaceables. Would love to have seen Bernstein, HvK, Furtwängler and Stokowski. I am surprised that Fritz Reiner , Artur Rodinzsky and Karel Ancerel have not received more commentary on this list. Heard live at the ROH, C. Kleiber, Haitink, Solti, and especially, Sir Edward Downes. I can’t believe that Giulini seems to have been overlooked! Nicholas Oppenheim.